Welcome to Will's Magic Particle Effects! I'm Will... Nice to meet you! Usually I do pixel art, but this is my first non-pixel art asset pack. Woohoo! This pack includes 20 high quality particle effect animations. Are you ready to add some magic to your game? Pretty cool, right? All animations are designed to be played at 60 FPS, for maximum smoothness. A wide variety of effects means that you're bound to find the right effect for your game! Need that perfect "level up" effect? How about a "cure" animation? Or even just a standard puff of smoke and sparkles? This is the pack for you! There are two general types of animations. The animations with particles that rise up from the bottom are designed for side-scrolling games, while the "burst" or explosion-type animations can fit in any kind of game. Best of all, these animations are provided as both PNG sequences and spritesheets! That means that no matter what engine you're using, as long as you can play animations, they're compatible with your game! 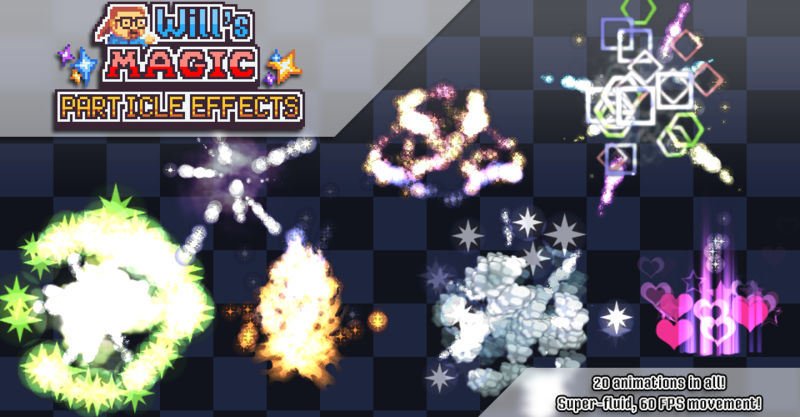 Will's Magic Pixel Particle Effects is the pixel art counterpart to this asset pack! It includes 20 high-quality, 60 FPS pixel art effects. Some of them are based on the effects in this pack, and some of them are totally new... But ALL of them are awesome! Head on over and check it out! I've made the license text available here if you'd like to read it.